Circle R Ranch is located just west of London, Ontario on 220 acres of rolling, wooded terrain in the Dingman Creek Valley. 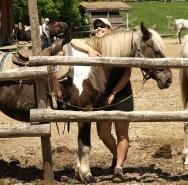 The beautiful hardwood forest, fields, and spring fed ponds allows for a top quality youth camping program in the London area with the unique specialty of western horseback riding. From all the exciting traditional camp activities including swimming, canoeing, kayaking, arts and crafts, music and sports to many other unique experiences.